Volgens kenners is daar slegs een manlike plant van die besonderse en baie spesiale broodboom wat Encephalarton Woodii heet, wat vernoem is na John Medley Wood. 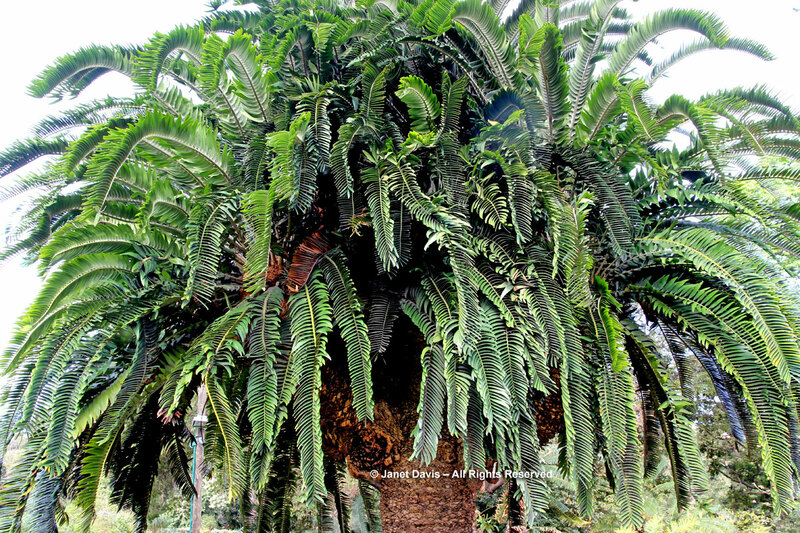 Only one specimen of Encephalartos woodii has ever been found in the wild – in South Africa. It was discovered on the edge of South Africa’s Ngoye Forest in 1895. The only specimen found in the wild was discovered by the English botanist, John Medley-Wood (for whom the plant is named). All Wood’s cycads in cultivation are clones of that last wild specimen, so all are male. They only produce the pollen-bearing male cones. Kew’s specimen arrived in 1899, it coned for the first time ever in 2004. Exciting as this was, it takes ‘two to tango’, so the quest for a female continues. Cycads dominated Earth’s landscape until the Jurassic Period, 200–150 million years ago. Cycad fossils have even been found in what we now call Antarctica. Encephalartos woodii has the biggest genome of any cycad. If you were to unravel all the DNA from just one cell it would stretch 20m. That’s ten times bigger than a human genome. 19th Century plant collectors in Ngoye Forest with the only Wood’s cycad ever found. These palm-like plants are ancient relics of a once widespread and dominant ancestry. Often referred to as ‘living fossils’, cycads were abundant in the Mesozoic era and reached their zenith in the Jurassic Period some 160 million years ago. Today only about 200 species exist and they are found mainly in Central America, South Africa and Australia. The demand for these plants as garden specimens has pushed them close to extinction in the wild and they are now specially protected. Their appeal is not only their rarity and ancient lineage but also their sculptural shapes, the symmetry of their foliage and the colourful fruiting cones. In 1895 the curator of the Durban Botanic Gardens, John Medley Wood, was on a collecting trip in Zululand and found a solitary clump of cycads in the vicinity of Ngoye Forest which turned out to be unique – it was later named Encephalartos woodii in his honour. Over the years the entire clump was removed from Ngoye and it is now considered extinct in the wild. The single specimen Wood identified was male and no female is known to exist. Suckers from the original cycad continue to provide new plants and the species is represented in many of the major botanical institutions of the world – including Kew Gardens in London where it is labelled as ‘perhaps the rarest plant’ in the Kew collection. WOOD’S CYCAD is a striking plant, tall with a shaggy green crown and bright orange cones. But despite its good looks, it will never find a mate. “The loneliest plant in the world, right here,” a guide tells a golf cart full of visitors touring the Durban Botanic Gardens. Found in a Zululand forest in 1895, it is the only cycad of its kind, and a male. Without a female it will never reproduce sexually, though offshoots have been used to make clones of it. The sense of its isolation is magnified by the security cameras trained on the plant to thwart thieves. Cycads, which resemble spiky palm trees and bear pineapple-shaped seed cones, trace their lineage to the time of the dinosaurs. But some species might not be around much longer. They are the world’s most threatened plant group, according to the International Union for the Conservation of Nature. The Woodii is named after John Medley Wood (1827-1915) who found a clump of four plants in 1895 on a steep south-facing slope on the fringes of the Ngoye forest about 30 km from Mtunzini in KwaZulu-Natal. These are the only Encephalartos woodii plants ever found and all of them are male plants originating from one plant. Medley Wood was a merchant sailor, farmer, trader, sportsman and botanist. He founded the Natal Herbarium and was Curator of the Durban Botanic Gardens. In 1903, Wood sent his deputy James Wylie to fetch some of the smaller offsets and three of them were grown in the Durban Botanic Gardens. In a 1907 expedition, Wylie collected two of the larger trunks, both of which are still to be seen on the Old Conservatory terrace in Durban Botanic Gardens. In 1907 Wylie noted that the largest of the four trunks was badly mutilated did not expect it to survive. He was right, by 1912 there was only one 3m tall trunk left in the wild, and in 1916, the Forestry Department, concerned about the survival of the remaining stem, arranged to have it removed and sent to the Government Botanist in Pretoria. It is thought that this trunk subsequently died in 1964. On a NATIONAL level, this legislation differs from province to province and is policed by the Nature Conservation authority. In the Western Cape (and probably the Eastern and Northern Cape who were all part of the same province in 1974 when the ordinance was passed) Encephalartos woodii and all other species and hybrids, are listed on Schedule 3 (Endangered Flora) and one requires a permit from Nature Conservation to move, sell, buy, donate, receive, cultivate and sell Endangered Flora and to own adult cycads. When buying endangered flora, make sure that the seller is registered with Nature Conservation and that they issue an Invoice. For more information, please see www.capenature.co.za, or contact your provincial nature conservation authority. On an INTERNATIONAL level all species and hybrids of Encephalartos are on Appendix I of CITES, the Convention on International Trade in Endangered Species of Wild Fauna and Flora. This means that wild collected material may not be traded and for each and every artificially cultivated Encephalartos plant or piece of a plant or a cone or pollen or seed, being carried over an international border requires a CITES Export Permit issued by the authority of the exporting country, and a CITES Import Permit issued by the authority of the importing country. Buyers are advised to make sure that the seller is a reputable, registered dealer and that an invoice is issued with the sale. For more info on CITES, please visit their website: www.cites.org – they give a great deal of info. including a list of national authorities of all member countries, or speak to your local authority. Finally, please note that the above legislation has nothing whatsoever to do with plant health and cleanliness legislation, which is applicable to the import/export of all plant material and which is usually under the jurisdiction of the Dept./Ministry of Agriculture. The beauty of Ngoye Forest is its combination of textures – the velvet-like grassy hills fringed by tall dense forest with great granite domes emerging at random along the ridges. The 3 900-hectare forest runs for about 10kms on a high ridge parallel to the ocean and is about 4kms wide. Botanically rich as it contains plants from the temperate Eastern Cape forests as well as the forests of tropical Africa, Ngoye is a ‘must’ for the discerning nature lover. Ngoye Forest is home to rare and endemic animals and birds such as the Red Squirrel, the Green Barbet, the Yellow-streaked Bulbul and the Green Butterfly. It was also home to the magnificent giant Wood’s Cycad (Encephalartos woodii) which has been extinct in the wild since the early 1900’s. The many tree rarities include magnificent giant umzimbeets (Millettia sutherlandia), Forest Mangosteen (Garcinia gerrardii), Forest Waterberry (Syzygium gerrardii) and the Pondoland Fig (Ficus bizane) amongst others. There are no fewer than nine varieties of fig growing in the forest and this abundance of fruit could be the reason the Green Barbet can only be found in Ngoye Forest. Good birding can be enjoyed by walking along the tracks through the reserve and there is usually a lot of activity in the first 2kms. Access to the forest has been greatly improved with concrete strips leading to the forest but sections of the road between the R102 and the forest are severely potholed and a robust vehicle is recommended. Pockets of the Reserve in the west can accessed on a good tar road from Obanjeni on the P240. There are narrow tracks which lead from one side of the forest to the other but they can be obstructed by fallen trees. Unless travelling with a guide, it is best to park outside the forest and walk along the tracks through the forest. Daar is ander skaars Suid-Afrikaanse broodbome en ook heelwat versamelaars, wêreldwyd. Suid-Afrika het heelwat broodbome wat inheems is in Suid-Afrika en waarvan permitte uitgereik word of kwitansies by aankoop. Oor die algemeen is die “oerplant” ‘n pragtige tuinplant. Ander lande het ook broodbome, dit word Cycas genoem waarvan daar nie ‘n permit nodig is in Suid-Afrika nie.